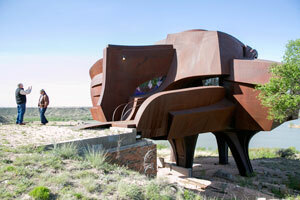 The famous Steel House in Ransom Canyon is like something out of a dream. It's perched on four legs – a massive animal springing from the canyon rim – and from the moment you cross the threshold and push aside the intricate wrought iron gate behind the glass, you find yourself in a Dr. Seuss-like world. A flight of steel stairs spirals up on your left, another winds down in front of you, and to the right is the living room. Full of windows, clear and stained-glass alike, the house is nevertheless neither light nor airy. The steel is ever present in the walls, in the ceilings, in the soft clang of your footsteps. The house has an uneasy feeling to it. Perhaps it's the rounded walls, the asymmetrical arched doors and windows, the uneven staircases – most without railings – or the gaping holes through which you can see other rooms and levels. 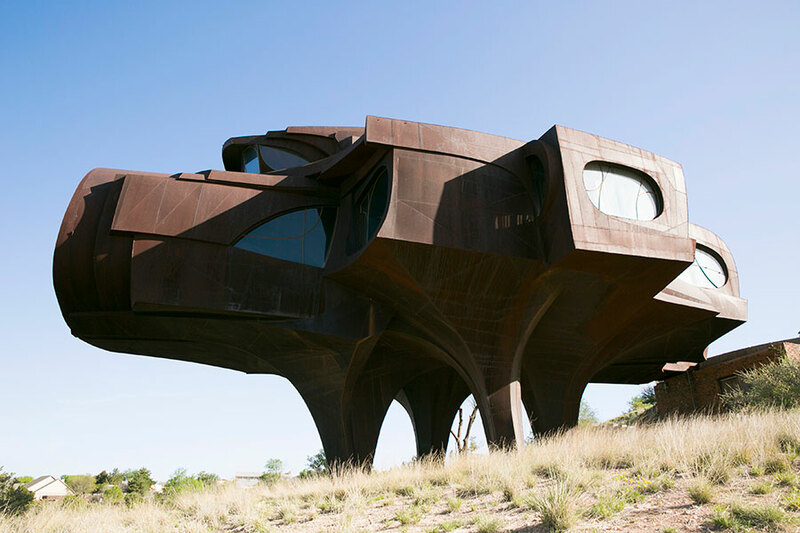 Designed, built and lived in by former Texas Tech University architecture faculty member Robert Bruno, the Steel House has three levels. 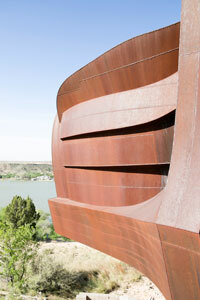 The second level – at ground or street level – houses the living room, with its sweeping canyon and river views. 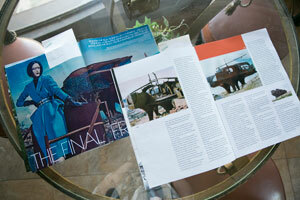 The kitchen is where you'll find copies of “Vogue” and “Twill” magazines featuring the house. The master bedroom and bathroom, a second bedroom, a combination laundry room and half bath and a den area are in the middle of it all. The only artwork hanging in the house are photos of the house itself. The upper level is the entertainment space, reached via stairs in either the entry or the second bedroom, just to the left of the entry. It is complete with a stage, seating room, the bathroom for the second bedroom (which, again, is a floor below) and an outdoor patio for those who would like to tempt fate by walking along the conspicuously unprotected, curved roof of the second level. Over the edge is a plunge into the canyon below. From the entry and the living room, stairs curve down to the lower level. It has nooks and crannies at every turn, almost no flat or level surfaces and flood lights clipped into the ceiling for illumination. 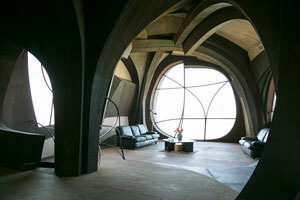 Unlike the rest of the house, sunlight doesn't penetrate because it's located inside the house's legs. This space was planned as a library and lounge, but like the rest of the house, it was left unfinished after Bruno died in 2008. Bruno started construction in 1974. He put in 110 tons of steel – all 3/16-inch or 1/4-inch grade – as well as adding insulation, heating and air conditioning, plumbing and electricity. Like West Texas' own version of the Winchester Mystery House, Bruno worked on the house for more than three decades with no clear plan for his residence – or at least not one he shared with Martinez. That's not to say Bruno was cheap in his building materials. The type of wood he chose for the staircase treads and the non-marble portions of the floor was expensive and came all the way from Brazil. When it arrived, it wasn't the blond color he wanted, so he changed his plans. Sparsely decorated, the house is left exactly as Bruno lived during his seven months in it. The only additions are signs that read: “Please do not lean against this surface” and “For your safety please do not enter.” The spare bedroom, blocked by a piece of Styrofoam upon which the first sign hangs, is cluttered with pillows, moving dollies, power tools and furniture, visible in wavy yellow, blue and purple through one of the many stained glass windows in the house. Obviously the rest of Bruno's belongings, these items were stored in the extra bedroom to await the time when the house was ready to be fully furnished. 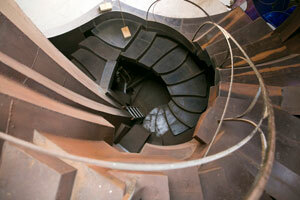 It's a time capsule, and in a way, a tomb of its own. For now, there are no plans to open the house. That's not the way it was when Bruno was alive. Martinez said the house's fame – and possibly its mystery – has drawn tourists from all around the world. One more question many have asked over the years is whether the house will eventually be completed. Michael Martin, an instructor in the College of Architecture and the director of external programs, said it's an understandable desire. As much as Martin would like to see the house completed, he doesn't believe it should be. The Steel House, however, is not the only legacy Bruno left. 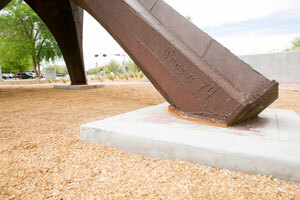 It was designed from a sculpture he made in 1974 while he was a professor at Texas Tech. After spending the last 35 years in an East Lubbock cotton field, that untitled sculpture was dedicated Monday (April 20) in the newly created Robert Bruno Plaza next to the Texas Tech College of Architecture at the corner 18th Street and Flint Avenue. But even that unique-looking structure may not be one of a kind. “There are four or five others, besides the house and the one at Texas Tech,” Martin said. Nailing them down is the hard part. One, Bruno told Martin, was done at the University of Notre Dame. 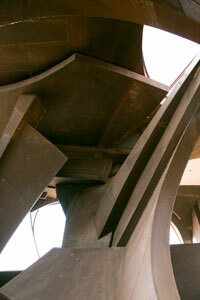 However, neither the university's art director or its architect know anything about such a sculpture. 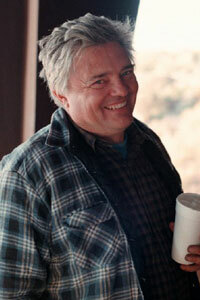 Martin was working in an architecture firm in 1976 when Bruno approached the firm about the piece. 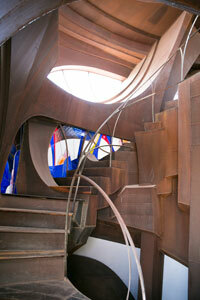 “He was trying to get us to purchase his sculpture or get us to integrate it into one of our projects,” Martin said. Bruno showed off his portfolio, which included images of four or five different steel sculptures, all like the one now at Texas Tech. Some were in California at some point, Martin said, but he doesn't know where they are now. There was also a smaller version in Ransom Canyon, just down the cliff face from the house, but it is now missing as well. Martin said he last saw it in May 2014: “I took my students out to Robert's house and it was there then,” Martin said. 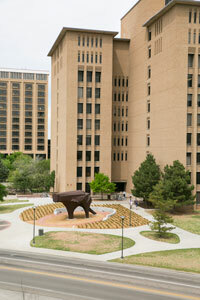 One of the reasons Martin pushed to bring the one known sculpture to Texas Tech was to bring awareness to Bruno's life and work. Martin remembers Bruno as an easy-going, but introverted, person. “He was probably a hard person to get to know,” Martin said. “I didn't know him as a close friend. We knew each other and we would talk and visit, but he was trying to finish his house. In his later years, he was really more focused on getting the house done. In a segment from the Texas Country Reporter that aired in 2008, Bruno explained his vision for the project was different when he started. “It wasn't necessarily smaller; it was less grand. It was less complex,” he said. “It would have been a lot easier to have a master plan from the beginning, but it wouldn't have been better, which is different. Easy isn't the only thing that matters. If easy really mattered very much to me I sure as heck wouldn't be doing this. And that's what Martin says Bruno's legacy turned out to be. Martin said, “He was very introspective. What he was doing was all in Robert. He didn't care what people thought.